Maybe your mama gave you up, boy. Star Citizen is free to try from now until Monday. Star Citizen's "Gamescom Free Fly" weekend gives you the chance to try out four vehicles—the Avenger Titan, Cutless Black, Dragonfly Black, and Protector—in both the "dogfighting stage Arena Commander, and first-person shooter Star Marine" modes. "To begin your adventure, you would normally pledge for one of our starter packages, which gets you a user-friendly ship and game access," states the website. "For a limited time, we're giving prospective Citizens the chance to explore the universe and test out a handful of ships and ground vehicles for free." To play, head on over to the Star Citizen website and sign up, using the promotional code GETINTOTHEVERSE. 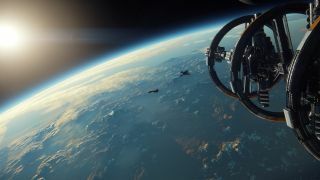 Criticism of Cloud Imperium Games intensified earlier this month when the developer opted to remove the cap on in-game currency that players can accumulate in Star Citizen. While the amount you can purchase in a single day is limited to 25,000 United Earth Credits (UEC), the limit on the number UEC you could store—150,000 UEC—was removed. Co-founder Chris Roberts responded by saying that removing the cap did not make Star Citizen pay-to-win because there is no "specific win state" and "you win by having fun, and fun is different things to different people".